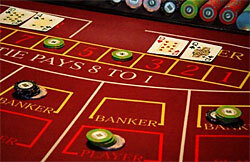 Over the years of baccarat history the game's 4 major variations have been implemented. In this respect, despite the fact that the major objective of the game stays the same, each of the variations comprises its own certain peculiarities. Punto Banko (also called American Baccarat) is considered to be one of the most widely-spread baccarat variations, which is played in all Las Vegas casinos, its rules being nowadays frequently taken as general baccarat rules. This variant may be found in its original look, or in a mini-baccarat alternation, which presupposes the fact that the gambler plays against the casino dealer. Moreover, its limits are much lower (from $2 to $500). Punto Banco is offered as much on modern online gambling sites, as in the traditional land casinos. 1. All players are allowed to shuffle and deal their own cards. 2. The cards are usually dealt with their faces down. 3. The player, having the biggest bet can see the face-down cards in the beginning, while others can't. 4. All players are allowed to choose, whether to take, or not to take the third card, themselves. 1. Players are allowed to choose, whether to take the third card, or not, having a cards' total value of 5. 2. A "Banker" (in a face of a dealer) is allowed to choose, whether to take, or not to take the third card, him/herself. 1. There're dealt 1 "Banker" and 2 "Player" hands. 2. All players are allowed to bet either on 1, or 2 "Player" hands, while the dealer is always a "Banker". 3. A "Banker" is allowed to choose, whether to take, or not to take the third card, him/herself. Every baccarat variation is unbelievably exciting to play, so every gambler, either a professional, or a mere beginner will definitely get pleasure from each of them. In this respect, once one has learnt the basic rules, he/she can try playing any other game's alternation, as after a closer observation, all of them turn out to be incredibly similar.